Fluids are some one which can flow from one place to other and both liquids and gases falls under this category. Fluids in the state of rest and their properties were studied in fluid statics and as we deal more about water, it is also called as hydro statics. Fluids in the state of motion are studied in fluid dynamics. Apart from pressure, here we need to talk about their energies also. They have potential energy,kinetic energy and pressure energy and satisfy law of conservation of energy. 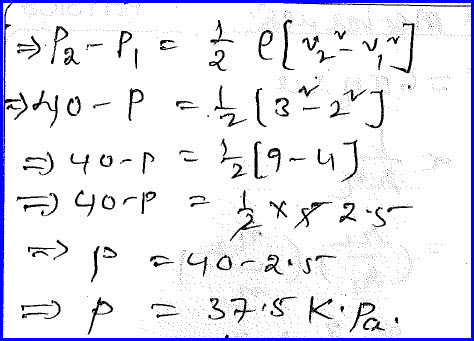 That is explained in terms of Bernoullie’s theorem. If the density of the fluid is constant they are called in compressible. We can ignore their viscous property and they are then called non viscous fluids. 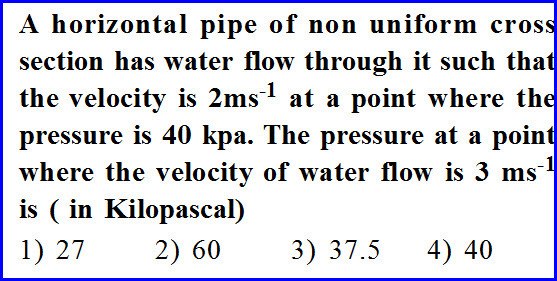 A horizontal pipe of non uniform area of cross section has water flows through it at a point with a speed of 2 meter per second where the pressures is 40 kilo pascal. We need to know the pressure at a point where the velocity is 3 meter per second. As the tube is horizontal, there is no potential difference between the two points. We need to apply Bernoullie’s theorem according to which the total energy of the system that is the sum of potential energy,kinetic energy and pressure energy is the constant. If one energy increases, other energy decreases but their sum remains constant. We can apply this with the given data barring potential energy part as it is same on both the sides and we can solve the problem as shown in the diagram below. 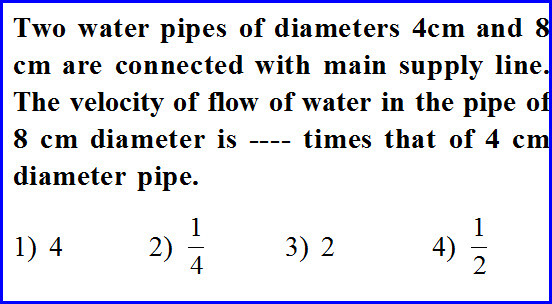 Two water pipes of diameters 4 and 8 centimeter are connected in series to a main pipe we need to find the ratio of velocities of the water in these two pipes and the problem is as shown in the diagram below. 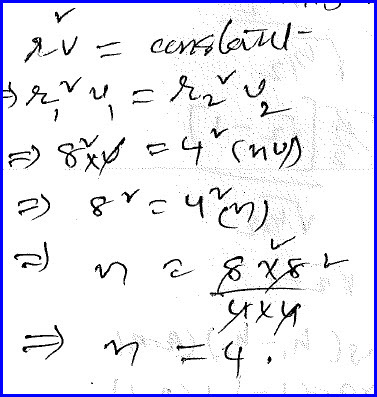 We know that as the two pipes are connected in series the rate of flow of water is same in both of them and hence the equation of continuity is very well valid concept here. According to it the volume of the water passes through a given system is always constant. It is nothing but the product of area of cross section of the pipe and the velocity of the pipe is constant. 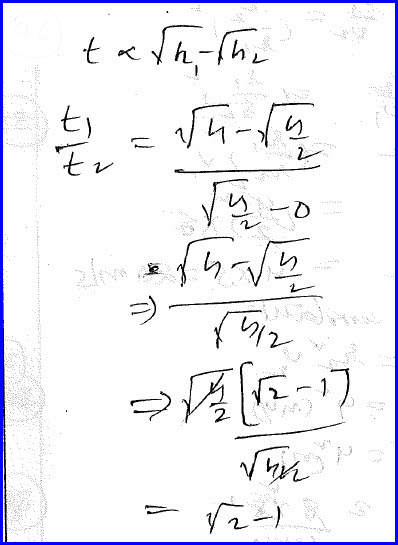 Area can be written as circular and it is proportional to the square of radius or diameter. Problem can be further solved as shown in the diagram below. Two equal drops of water are falling through with a velocity 10 meter per second and that is constant. If these two drops are combined together and a single drop is formed, we need to find the velocity of that combined drop and the problem is as shown in the diagram below. 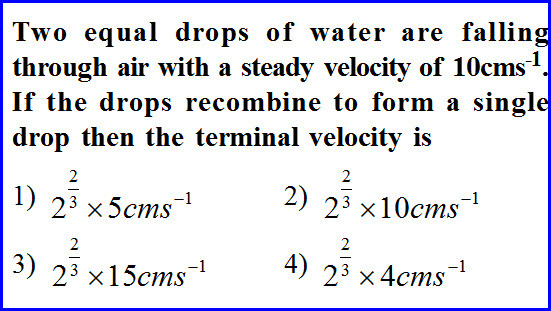 The constant velocity acquired by a spherical drop while passing through a medium is called terminal velocity and at that instant the resultant force acting on the system is zero. We have proved earlier in this chapter concepts that the terminal velocity is directly proportional to the square of the radius of the drop. When two drops are combined as both of them are of same density, its total volume is the sum of the volumes of two drops. Taking that into consideration, we can find the relation between small and large radius and the problem can be solved as shown in the diagram below. 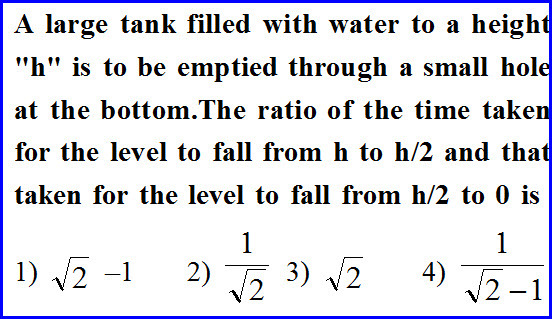 A large tank is filled up to certain height and we need to know the ratio of time taken by a small hole placed at the bottom to empty first half of the height of the water when compared with the second height of the water. The problem is as shown in the diagram below. We can prove and we have proved while handling this chapter that time taken to empty the tank is directly proportional to the difference of height of fluid from where to where they are emptied in terms of heights of fluid under square root. 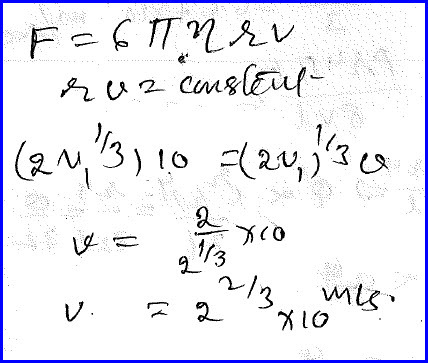 In the first case, it is emptied from full to half and in the second case, it is emptied from half to zero. By writing that data, we can solve the problem as shown in the diagram below.